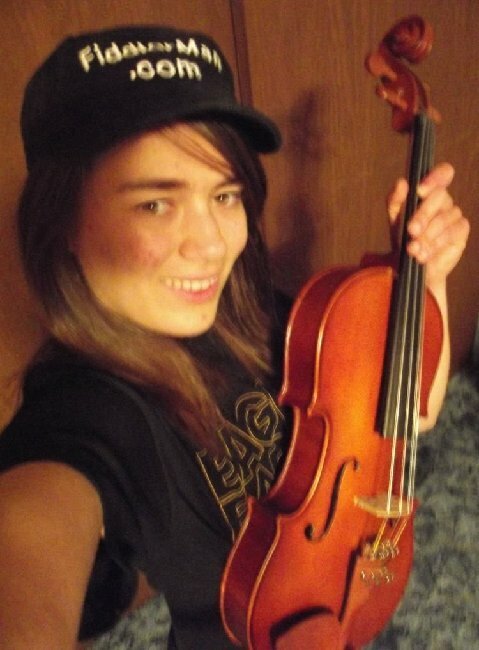 Meet "Mustang" from Fiddlerman's "Fiddle Talk" forum | LEARN TO PLAY THE VIOLIN FOR FREE! I have been homeschooled my whole life, but I do take an orchestra class at the local high school. I am also in my second year of PSEO classes from Northwestern College. If you don’t know what PSEO is, it stands for Post Secondary Enrollment Options. It’s an option we have in Minnesota for high school students to take college classes for free. It’s a very nice option! I usually practice 15 minutes at a time and probably spend a total of 2 hours practicing every day. • Your greatest personal experience with playing? Getting picked to be the soloist in orchestra! • What other instruments do you play? I also have an ocarina, but I’m as good at playing that as I am at the harmonica. I have no idea where to learn how to play ocarina. There’s no Ocarinaman! • What does music mean to you? Music is like, my life! God, my parents, my violin teacher, FM, and SaphireRain42 and Sori1004jy on Youtube. I have been classically trained. Classical and movie soundtracks are the best! I listen to Vivaldi and the Lord of The Rings and Kung Fu Panda soundtracks a lot. I also like Christian rock a lot! I love to ride horses and play classical arcade games!! My favorite game is PacMan. I am a PacMan fanatic! My dad’s side of the family is not musical at all. I don’t think anybody from his side of the family ever played an instrument. My mom’s side of the family is very musical. I’m glad I took after my mom. Hahah! My mom plays the hammered dulcimer. I have a cousin who also plays violin and another cousin who is a professional luthier. I learned how to play on a Cremona SV-175 violin. It was a nice instrument to learn how to play on. Then, I found this Lewis and Son Ton Klar Dancla violin (which is the one I use now) on Ebay with a starting bid of $1. From the pictures, it looked like it was in decent condition. I didn’t think a dollar was too much to pay for it, so I bid on it! It eventual went up to $50, but I still won it! It has a crack that would cost a ton of money to repair and it’s really heavy! I don’t think a heavier violin has been made! Well, maybe I’m exaggerating a little, but it’s really heavy! So, that’s all of them! I have 4 violins… violins are like potato chips, you can’t have just one! Hahah!